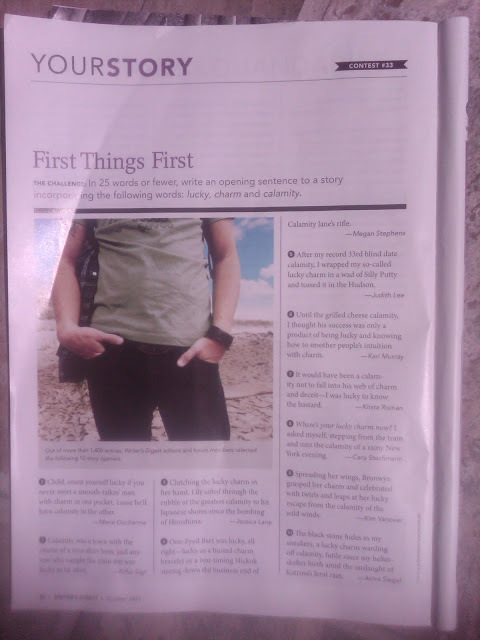 The Times New Roman: OCTOBER 2011 WRITER'S DIGEST! It's funny how things have a way of appearing when you need it the most. After a not so great day (it's only noon), I received a new copy of Writer's Digest in my mailbox. I was hoping that this would be the issue that my winning entry for one of its writing contests would appear. I wrote the opening sentence on a whim while paging through the magazine. I submitted it with a laugh and didn't think of it again. I discovered that I was selected as one of the winners by accident. Thanks for the email notification, Writer's Digest!